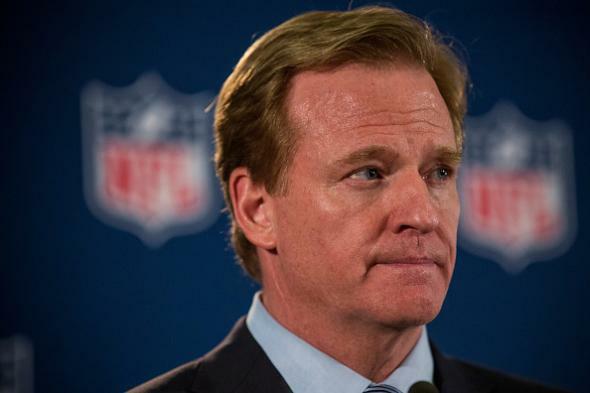 Roger Goodell, Ray Rice tape: NFL investigator told NFL security chief he hadn't asked for it before Goodell statement. ESPN is reporting that the NFL’s lead investigator into Ray Rice’s assault case told the league’s director of security on Sept. 8 that he had never asked the Atlantic City Police Department for an elevator security tape that showed Rice punching his then-fiancée—only for commissioner Roger Goodell to claim multiple times in following days that the NFL had asked for the tape. Rice was arrested in February of this year on assault charges. Accounts alleged he’d knocked his now-wife Janay out in the elevator of an Atlantic City casino-hotel, and security video from the hotel showed him carrying a seemingly unconscious Janay out of an elevator. Reports indicated that a second video existed that showed Rice punching Janay inside the elevator. In May, Rice was accepted into a pretrial diversion program, avoiding a potential conviction. Goodell met with Ray and Janay Rice in June and announced Ray Rice would be suspended for the first two games of the 2014-2015 NFL season, which began in September. On Sept. 8 TMZ posted the video of Rice punching his wife inside the elevator. Goodell then extended Rice’s suspension indefinitely—explaining that the NFL had not seen the second video and had asked law enforcement sources for it but not been given it. Goodell made this claim in a press conference and in a memo to NFL teams stating that “on multiple occasions, we asked the proper law enforcement authorities to share with us all relevant information, including any video of the incident.” Goodell mentioned the “New Jersey State Police, the Atlantic City Police Department, the Atlantic County Police Department and the Atlantic County Solicitor’s Office” as organizations the league had contacted. Goodell also said that Rice was “ambiguous” and misleading in their June meeting about what happened in the elevator and that Goodell was left with the impression that Ray Rice merely “slapped” Janay Rice. A letter written by Goodell to the NFL Players Association said the version of events that Ray Rice gave during the June meeting was “starkly different” than what was portrayed on the elevator tape. Rice appealed his suspension. An independent arbitrator collected evidence and took testimony and ruled on Nov. 28 that Rice had not misled Goodell during the June meeting. Now comes word from ESPN that, during Rice’s appeal to the arbitrator, emails surfaced indicating that the NFL’s investigator did not ask the Atlantic City Police Department for the tape—which the police department did have in its possession. Goodell’s justification for indefinitely extending Rice’s suspension hinged on the idea that the league was shocked by the contents of the second tape and had been rebuffed in its earlier attempts to obtain it. But evidence compiled during Rice’s appeal, including the material reported on today by ESPN, strongly contradicts if not disproves both elements of that justification. Complicating the narrative even further is an AP report that a law enforcement official (though not necessarily one from the Atlantic City police) sent the NFL the elevator tape in April and received a voicemail from the league confirming receipt. (The voicemail was reportedly from a woman; the league’s chief Rice investigator and head of security are men.) There’s much more to come on the Ray Rice-Roger Goodell story, one presumes.